From all of us at Babies of Homelessness, thank you! We are so grateful for your generosity. How can I register and submit a wish list? 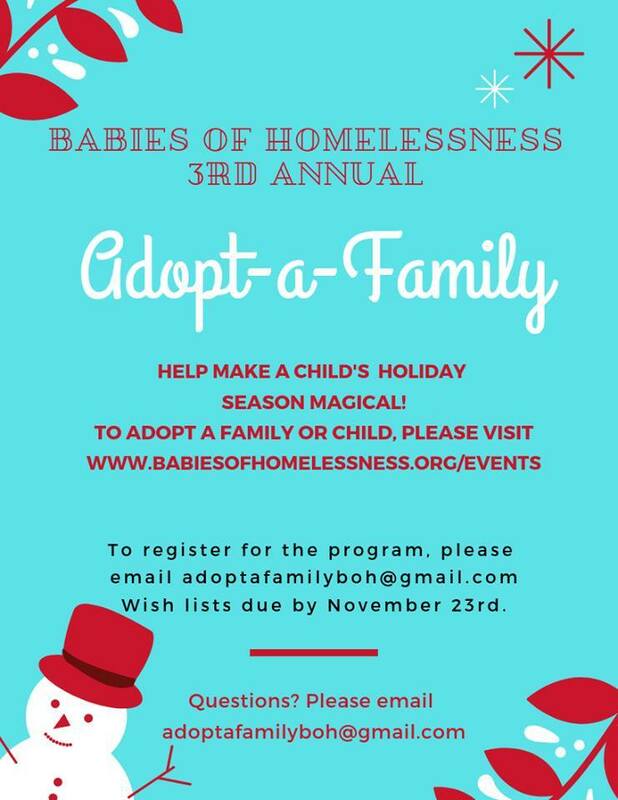 Email us at adoptafamilyboh@gmail.com and we’ll respond with a copy of the Wish List Registration form. Please complete the form and email it back by Friday, November 23rd. We will let you know when you’ve been matched with a sponsor. Will we receive everything on our wish list? Your sponsor will choose and purchase the gifts. We don’t know exactly what will be given, but we ask sponsors to choose based on the Wish List. When will I receive the gifts? We will coordinate a time to deliver the gifts to you between December 15th-22nd. A delivery volunteer will be in touch with you about a specific delivery date and time. Will the gifts arrive wrapped? Yes, all gifts will be wrapped and labeled with the child’s name. Send us an email at adoptafamilyboh@gmail.com and we’ll get back to you as soon as we can! How can I adopt a family or child? On November 25th, a link to a sign-up website will be posted here. You will be able to view a short description of the families, then choose and sign up for the family that is best for your sponsorship. Can I still help, even if I am unable to adopt a family or child? Absolutely! We would love donations of grocery store gift cards so that families can purchase food for a holiday meal. Gas cards are also very appreciated for our families living in cars and RV’s, as fuel is needed to keep their family warm. Additionally, we can use donations of wrapping paper, bows, and gift tags. What kind of gifts and how many gifts should I purchase? Each child will have specific gift wishes and general likes/interests on their wish list. We allow sponsors to choose the gift(s) based on the information on the wish list. Should I get gifts for the parent(s)? We leave that up to you! The parent(s) would of course love a gift, but it is not required. Should I include a grocery gift card to go towards a holiday meal? Yes, please! We would like each family to receive at least $25 to a grocery store like Safeway, Fred Meyer, Albertsons, or Walmart so that they can purchase food for a special holiday meal. We ask that all gifts are delivered to us unwrapped. Please mark each gift with the child’s name. Consider including a roll of festive holiday wrapping paper and some bows/ribbon so that the Babies of Homelessness volunteers can get the gifts looking perfect for the recipients! 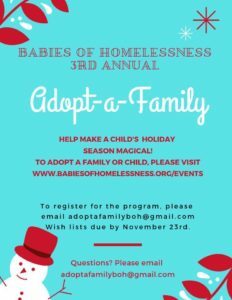 When are gifts due to Babies of Homelessness? All gifts must be received by Saturday, December 15th. Where do I deliver gifts? Please deliver gifts to Holly Hills Clubhouse (19200 Hollyhills Dr NE, Bothell, WA 98011) on Friday, December 14thbetween 12pm and 7pm or Saturday, December 15th between 9am and 12pm. If you prefer to deliver your gifts directly to the family you sponsor, you may indicate that preference when signing up. What happens if I realize I am unable to participate after being matched with a family? Let us know as soon as possible so that we can find another sponsor for the family. Our goal is to match every Babies of Homelessness family with a sponsor and ample time is needed to coordinate.